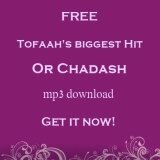 The Tofa'ah Blog of Jewish Music is here to add harmony to your life! It keeps you up-to-date with all the additions and changes made to the Tofaah website. It's the easiest and fastest way to stay informed about everything that's happening on the site, where and when we're performing and Tof Miriam sponsored events. This is where Yona, occasional guests or our Tofaah Webmistress will share the latest in the world of Jewish music, especially the music of Jewish women. It's also a place to schmooze about musicianship, Jewish musicians, Jewish artists of all kinds, and how to use our art so we can all come closer to Hashem and each other. Comment on the post, share your opinions and let's get this discussion going! If you subscribe to our RSS feed, the information on this page will be delivered automatically to your RSS reader. To subscribe, right-click on the orange RSS button below the navigation on the left and then paste the URL into your RSS reader. Or, if you have a personalized home page at Google, My Yahoo! or My MSN, simply click on the appropriate button below the RSS button. Add some Jewish music notes to your day: Follow us on Twitter. 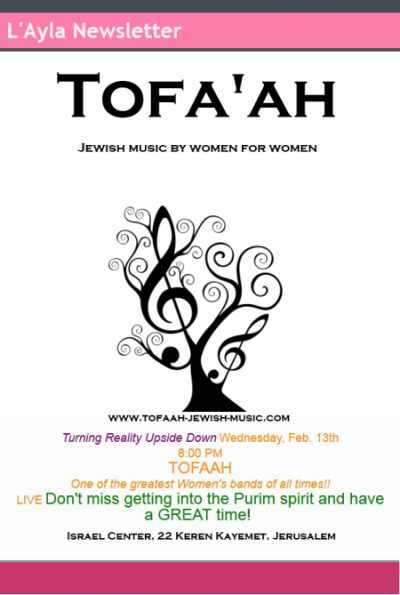 Continue reading "Tofaah Jewish Music News"
Come celebrate the chag with us! 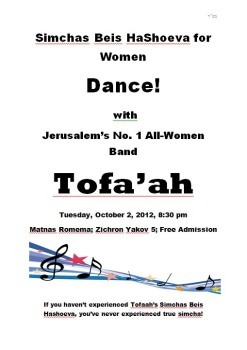 Bring your simcha and come dance with us! Double Adar - Double the Simcha! 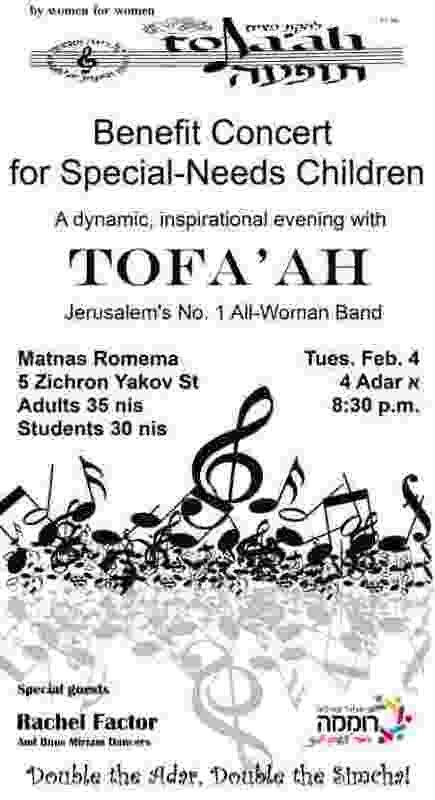 Join us for a fabulous fund-raising evening in Jerusalem on Tuesday, February 4, 2014. Sing, dance, be inspired! We'll also be joined by the talented Rachel Factor and her Bnos Miriam Dancers. Monday, September 23, at the Romema Community Center, 5 Zichron Yakov St, 20:00 pm. Free admission. It is written that the power of sadness came into the world when the waters were divided into the lower and the upper firmaments during Creation. The Simchas Beis Hashoeva water libation ceremonies in the Temple rectified this by joining those waters once more, which is perhaps why the Talmud tells us that whoever has never seen a simchas beis hashoeva has never seen joy in his life. So come eradicate all the sadness and celebrate this great joy with us! Note that the event has been incorrectly advertised in the press as being on Tuesday. It is not - it is tonight, Monday, September 23. We hope to see you there. Get Ready for Purim - It's Adar! It's Adar, ladies, time to get ready for Purim. And how best to get into the Purim spirit than with Tofa'ah? Join us for a rousing, music and fun-filled evening of inspiration, joy and jazz! It's time to celebrate again! 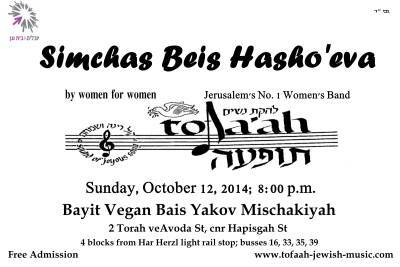 This Sukkos, mark your calendar for Tofaah's annual Simchas Beis Hashoeva for women. There's nothing else like it. Come fill your soul with the joy of the chag and dance the night away with us. When: Tuesday, October 2, 2012; 8:30 p.m. Spread the word - tweet this, post on Facebook, Stumble It or simply pick up the phone and tell a friend. We want to see you all there. P.S. If you want to get in the mood already, download Azamra or Feel the Power and start dancing! Here's a whole new way to discover the art and artists of Jerusalem. Tali Tarlow has been running Jerusalem Scavenger Hunts in the Old City for some time. She's also been expanding to include scavenger hunts in other areas of the city. Now comes a special scavenger hunt that showcases Jerusalem artists working in Nahlaot. Tali, an experienced educator, designs the scavenger hunts to appeal to a range of ages, from first-graders to grandparents – there's an age-appropriate task for everyone in the game. The hunts take you through neighborhoods, learning about the history of the area, searching for clues, and exploring what Jerusalem can mean to the participants individually. This group activity is about fun and learning, but is also a rewarding journey inward. This particular scavenger hunt takes participants through Nahlaot, a fascinating and quirky neighborhood that is also home to a thriving artists' colony. In this area where old and new intersect in unexpected ways, artists too seek to come to terms with the powerful dialectic between ancient traditions and the modern world. The hunts are not specifically for women, nor do they focus exclusively on women artists, but I thought you'd want to know about them anyway. Number one, if you're a Jerusalem artist with a studio in Nahlaot, you might want to get in touch with Tali and let her know about you. Two, most Jerusalem Scavenger Hunts are booked by groups – so if you want to arrange a girls' day out, or a family excursion, this is a fabulous activity that will be fun for the group and will also appeal to the artist in you. Find out more about Jerusalem Scavenger Hunts here, or read about my own experience on a recent Jerusalem Scavenger Hunt through the Old City's Jewish Quarter. Have fun exploring our holy city! 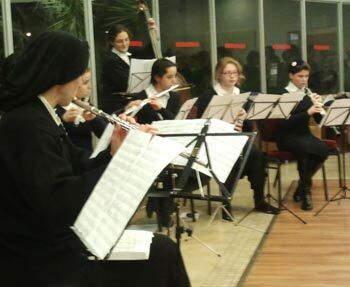 Last Saturday night saw young women bringing cheer and music to the Tamir Retirement Home in Jerusalem. The Accordion Orchestra and the Woodwind Ensemble of the Ron Shulamit Conservatory performed to a packed hall that included Tamir residents, proud grandparents, parents and lots of toddling siblings already in pajamas. 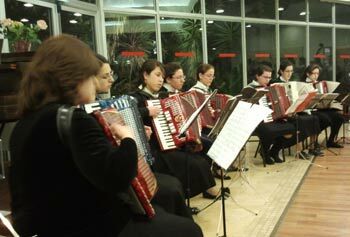 The Accordion Orchestra is conducted by Devora Tiroler, a long-time friend of Tof Miriam. 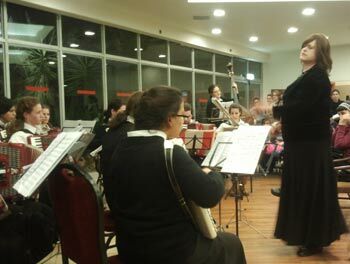 The Orchestra was accompanied by Tofaah's very own drummer and percussionist, Yona Yakobovitz. This year's orchestra was largely composed of new members, who despite being relatively young high-schoolers, put on a very impressive, professional performance. Congratulations to them all, and to Mrs. Tiroler, for her fine leadership and always passionate conducting. On the basis of last Saturday night's performance, we have high expectations for the Accordion Orchestra's end-of-the-year show. 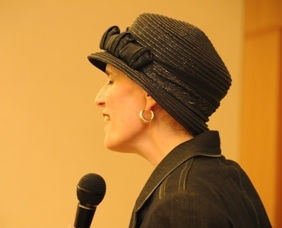 This week is the parasha of Shirat Hayam – the Torah reading in which Miriam Hanevia leads the women in a song of praise after the Children of Israel are saved at the Splitting of the Sea. It is the event described so joyfully in the Tofaah song They Were Dancing from the Feel The Power CD. The Koidenover Rebbe, in sefer Zecher Tsadik, writes that at kriyat Yam Suf, the splitting of the sea, Moshe Rabbenu sang with the men in a line. But Miriam took the women and sang and danced in a circle. In a circle, no one is more important than the next person – everyone is equal and equally holy. Miriam led the women in a dance of such achdut that they reached a level that will not be seen in the world again until the coming of Moshiach. Tof Miriam is named after her. 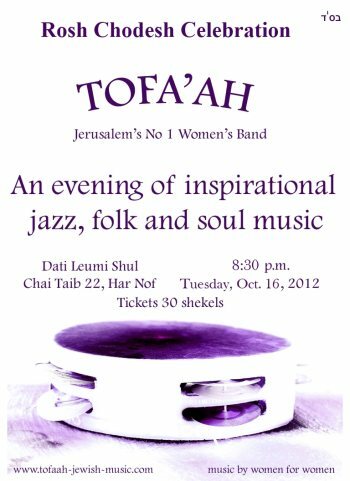 Like the women at Shirat Hayam, we hope to bring all Jewish women together, dancing and singing praise to G-d in one large, unified circle. Each of the seven prophetesses represents one of the seven sefirot. The sefirah associated with Miriam, is gevurah. Gevurah is being strong enough to find the good or the sweet in the hard and difficult things that happen in our lives. Chazal say that one of the brachas in the time of Moshiach is that each person will be able to see the reason for and the bracha in everything that happened in their life. So we see a remez, a hint, to this in Miriam's life and in her name itself: when a person is in the middle of something bitter (MAR) but has emuna in Hashem (the Yud) then it leads to the last Mem in her name, which stands for Moshicah. The letters MYM in her name also form the Hebrew acronym we've been using to describe Tofaah's music: Muzika Yehudit Modernit, modern Jewish music. The letters spell mayim – the Hebrew word for water, always a symbol of Torah. In this week's Torah reading, after the Splitting of the Sea, the Children of Israel spent three days wandering in the desert with no water. They came to a place called Mara, where they found water, but the waters were bitter. Hashem told Moshe to take a specific tree and put it in the water. The waters became sweet and drinkable. The Torah is our Tree of Life (as we sing in our song For All to Hold ). It has the power to make everything in our lives sweet, even the most bitter. We hope our music will water your souls and nourish your spirits as you and we all strive together to grow ever closer to Hashem. Power Surge: Tofa'ah and Rabbanit Yemima Mizrachi! Rabbanit Yemima Mizrachi recently was voted one of the most influential women in Israel and she's one of the most in-demand speakers today. One of her main messages is the importance of joy - simcha - in our lives and avodas Hashem. Does this sound like Tofa'ah? You bet. So imagine the powerful combination when Rabbanit Mizrachi speaks at Merkaz Shamayim Ashira in Tel Aviv, on January 29, 2012, followed immediately by Tofa’ah. Rav Shwartz will deliver a halacha shiur at 9:15. Rabbanit Mizrachi will speak at 10:00. Please join us for all or part of the morning and let your spirits soar! For a taste of Rabbanit Yemima Mizrachi's approach, you can listen to or download her wonderful shiur in English, The Art of Being Happy here. Listen to her shiur to the end, then tell us - do you do sponja and housework to our music? You can also subscribe to Rabbanit Yemima's weekly Hebrew parsha e-mail on her parasha.org website. 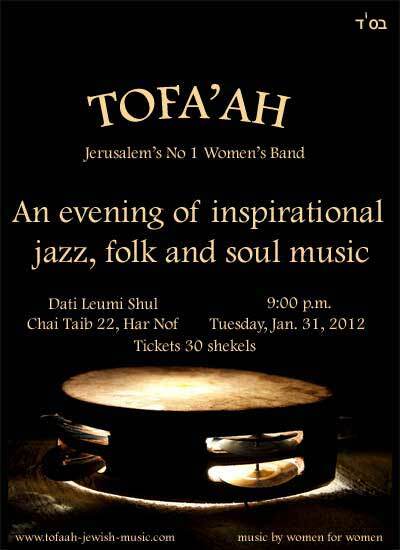 Join us for an intimate evening of Tofaah's original music in Har Nof, Jerusalem. Join us to celebrate the last night of Chanukah in Yerushalayim Ir Hakodesh - dance, sing and let your light shine! Where: Ulamei Tamir, Heichal Alef, 11 Golda Meir Blvd. When: Dec. 27, 2011; 7:30 p.m.
Getting there: From the Central Bus Station or Binyanei Ha'uma, buses 7, 67, 39 and 39א. Tickets: 25 shekels at the door. If you listen to Tofaah's album For All Time, you'll find a song called This Is The Day . 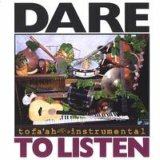 I used a salsa rhythm in that song, together with a bit of klezmer, if you want to call it that - a nice Jewish salsa, with lots of different rhythmical textures. What I like to do when we play salsa, because we feature so many different percussion instruments, is to layer the colors of the different instruments to create a nice flowing motion, so people will want to groove to it, to dance, lift their spirits and be joyful. It's meant to make you dance: There is a day like no other day, and that is this moment in time, today - celebrate it! Why let a good breakfast go to waste during International Drum Month? Here's the first of our rhythmical etudes … Yona's al la carte specialty. International Drum Month - Get Ready for November! November is International Drum Month. 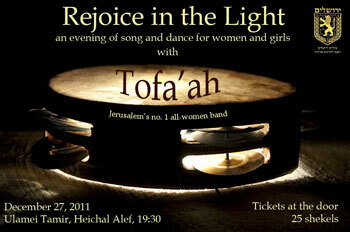 Tofaah is celebrating by having home drum circles throughout Jerusalem and Israel. But what if you can't come to an official drum circle? Do what we do best – pull out the pots and pans, hand out wooden spoons to all the kids (and Mom, too) and let the rhythm lift you higher! Make your own drums. Coffee cans, yoghurt containers, small water bottles - you get the idea. Assemble a variety of different containers, put a few beans or some dry rice inside, decorate to your artistic heart's content, and then get your band ready to play! Maybe it's time to take the plunge and sign up for drum lessons? If you're in Jerusalem – fill in the contact form here for a chance to learn how to play drums and percussion with Yona. And if you live in the continental U.S., the Percussion Marketing Council is giving away free "beginner drumming" kits – a set of drum sticks and instruction book. Claim yours by downloading the form here, getting it signed by a music shop near you and mailing it in before December 31. Step to the beat of your own drummer! Continue reading "Thank you for Contacting Yona"